Commissioning and transporting – experience our wide range of solutions live and in action from 19 to 21 February at LogiMAT 2019 in Stuttgart. SAFELOG will provide information on its successful technology and the latest developments in its transport robots AGV S/M/L and will be happy to inspire you again this year. 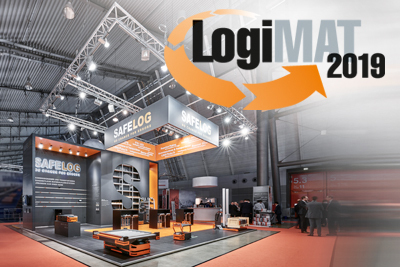 Each year at the LogiMAT, international exhibitors meet decision makers from industrial, trade and service companies looking for skilled partners at the exhibition centre at Stuttgart Airport. The ever expanding, international trade fair for intralogistic solutions and process management is the largest annual intralogistics fair in Europe and provides a comprehensive overview of the market. The focus is on innovative products, solutions and systems for procurement, warehousing, production and distribution logistics. Take this opportunity to discuss general or specific questions related to intralogistics, or questions from your immediate working environment with our logistics experts. We would be happy to arrange a consultation appointment with you on site. Just give us a call in advance on +49 89 215 4261-0 or write to us.